A species of frog endemic to the Pacific Northwest faces a 50 per cent increase in the probability of extinction by the 2080s due to climate change, according to a new study published by SFU researchers. 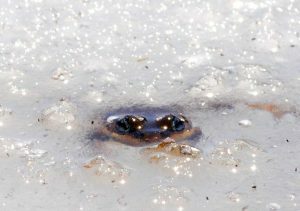 Specifically, they aimed to assess how the warmer and drier temperatures occurring with climate change affect the survival of two distinct aspects of the frog’s life cycle: in the aquatic stage where the frogs develop as tadpoles in shallow ponds, and in the terrestrial environment stage where they live as adults. This entry was posted in Press Release External by Zoe Gentes. Bookmark the permalink.